Boughs Ala Round is another addition to the growing Ala Round Collection, which also includes: Eggs Ala Round, Ornaments Ala Round, Snowmen Ala Round, Autumn Ala Round and Flowers of the Holy Night. Instead of being stitched in the traditional “green and red” colors of Christmas, this design incorporates a creative pallet of “blue-green and a deep pinky-red”. Although difficult to see in the photo, this design is elegantly adorned with a generous amount of Mill Beads to give it that holiday bling! General Information: Stitched using 2 threads of floss over 2 threads of fabric. Stitched entirely in full stitches. 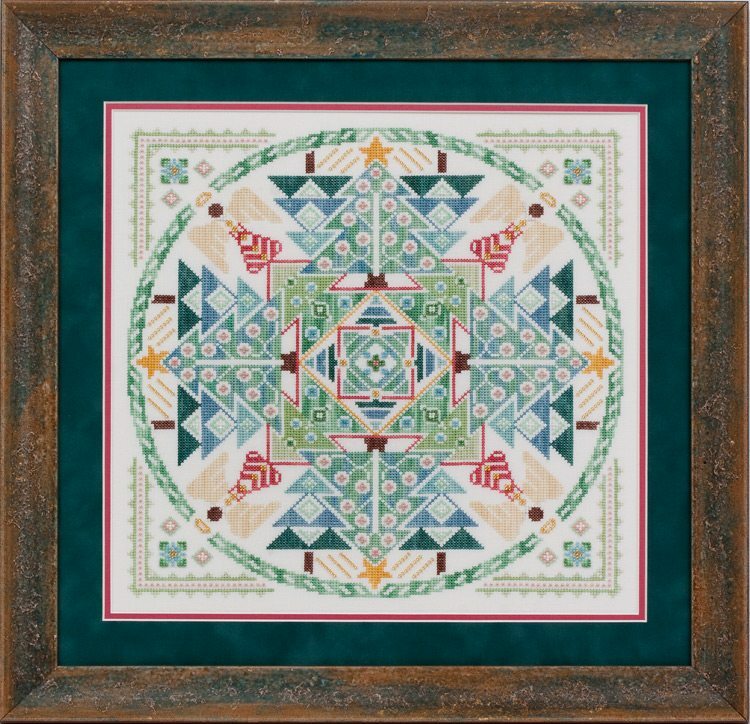 Matting and/or Framing: Provided by Cindy Dunlow Frames, Six Gun Plaza, 4901 E. Silver Spring Blvd., #701, Ocala, FL 34470, (352) 236-4263, E-mail: cdframes@aol.com. Materials Summary: Uses 11 colors (13 skeins) of Dinky Dyes hand-dyed silk floss, 6 colors of Mill Hill Beads, and 1 color of Sullivans/DMC/Anchor for attaching beads. Comparable Sullivans/DMC/or Anchor colors are provided for this design. NOTE: Please be advised that although color comparables are provided in other floss lines (Sullivans/DMC/and Anchor), these are “best match” alternatives. Should you choose to stitch the design in an alternative floss line, your finished design will look different.